We offer Carbide Cone Rings used in Wet Wire Drawing Machines. We make these Carbide Rings as per clients drawings and specifications. We offer Carbide Cone Rings as per client’s drawings and dimensions. These are used in wet wire drawing machines in basic. The products are being manufactured using very superior quality raw material sourced from reliable vendors associated with us over a very long period of time. They undergo various quality tests to ensure high efficiency limit and flawless performances. Our products are known for their dimensional accuracy and compact design. These rings are available in different sizes and can also be customized according to the requirement of the clients. They are easy to install and re install. 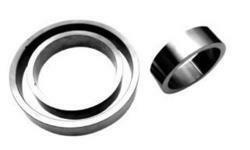 Looking for Carbide Rings ?